There are greater risks when dealing with human or animal waste. When you consider the risk of infection and amount of diseases that can be transferred in blood and other bodily fluids, it is essential that these spills be attended to as quickly and safely as possible. Enretech BettaClean is a powerful organic absorbent powder that quickly absorbs these kinds of spills immediately upon contact. Where the spilled liquids consist of human or animal body fluids (ie: blood, urine, vomit, faeces) or other possible contagion (i.e. spoiled food, sullage, sewage) special steps must be taken to ensure the safety of the spill responder and to leave a clean and sanitised surface behind. 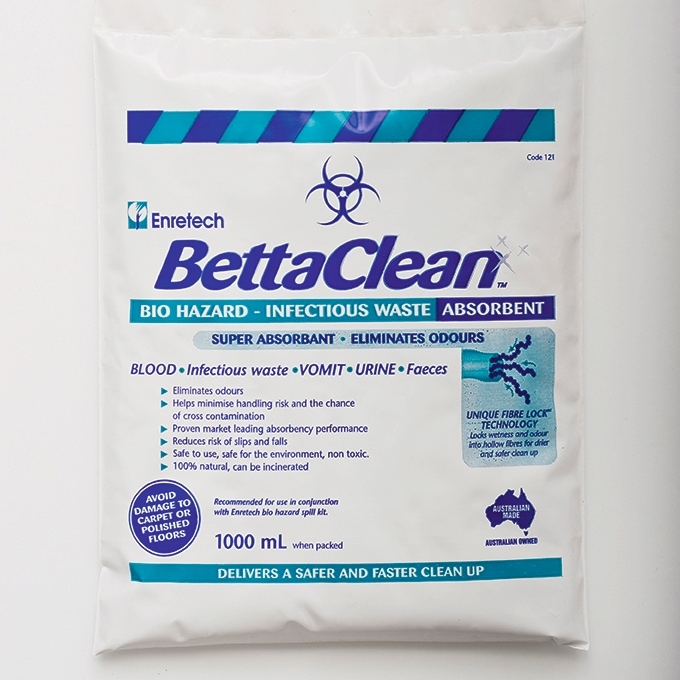 This absorbent is ideal for any locations, including schools, day care centres, aged care facilities, hotels, shopping centres, hospitals and medical clinics, public and private transport and building maintenance and is part of the BettaClean Bio-Hazard spill response kit.